Dance All Night, With DJ Mike! Mike Dunn has kept the party going in Pittsburgh for the past fifteen years! Not only is he the lead singer of Pittsburgh’s top party band, The Lava Game, but is an experienced DJ. With top of the line equipment and an endless library of music, there is no job too big or small. 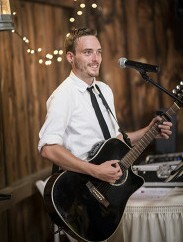 DJ Mike offers an exclusive wedding package that includes DJ/emcee services and dance floor lighting in addition to an intimate acoustic guitar cocktail hour featuring popular cover songs at one flat rate. Let DJ Mike Dunn make your next event or wedding unforgettable!